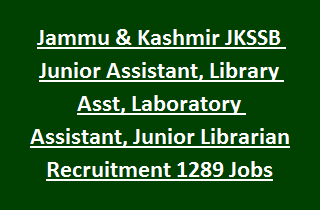 JKSSB Junior Assistant, Laboratory Assistant Jobs Recruitment Notification 2017: Jammu and Kashmir Services Selection Board JKSSB has released recruitment exam Notification to select candidates for the vacancies of Junior Assistant, Library Assistant, Laboratory Assistant and Junior Librarian Jobs. There are total 1289 vacancies available in Jammu & Kashmir JKSSB Recruitment Exam 2017. Candidates who are willing to apply for all these Lab Assistant, Junior Assistant vacancies are required to go through JKSSB notification. Read the instructions to fill the application copy. Open the JKSSB recruitment link http://www.jkssb.nic.in and apply for respective post. Complete the Application process and starts submitting from 18th October-2017 for this JKSSB Recruitment Exam 2017. Ending date to submit application copy is 11-11-2017. After the process of selection candidates will be offered Rs. 10,500/- per month and other allowances. Age limit to apply for this JKSSB Junior Assistant, Laboratory Assistant Jobs is 18 years to 40 years. All category Applicants need to pay examination fee of Rs. 350/-. Further details of educational Qualifications, Age limits, Pay Scale, Pattern & Syllabus of written test, Application fee and other important information related to Jammu and Kashmir Services Selection Board JKSSB Junior Assistant, Laboratory Assistant, Library Assistant Jobs Recruitment are given below. Jammu & Kashmir Service Selection Board JKSSB has released total 1289 posts, which are mentioned below. Total no of vacancies: 1289 posts. 1. Junior Assistant: 575 posts. 2. Laboratory Assistant: 392 posts. 3. Library Assistant: 228 posts. 4. Junior Librarian: 94 post. Applicants have to check the JKSSB official notification for educational qualification related information. Pay Scale for all posts in JKSSB Recruitment is Rs. 10,500/- plus allowances as per Jammu & Kashmir Govt rules. Minimum age should be 18 years and maximum age limit is 40 years as on 01-01-2017. Relaxations in age applicable as per JKSSB rules. Eligible candidates have to attend for written test and personal Interview held by JKSSB selection board. Pattern, Date and venue of written test and interview will be informed later. All eligible applicants may go through Jammu & Kashmir SSB official website http://www.jkssb.nic.in apply for Jr. Assistant, Library Assistant and other jobs. Click on desired post. Open the application form. Fill the form with the instructions given in JKSSB official notification. Submit the final copy of application from 18-10-2017 till 11-11-2017.